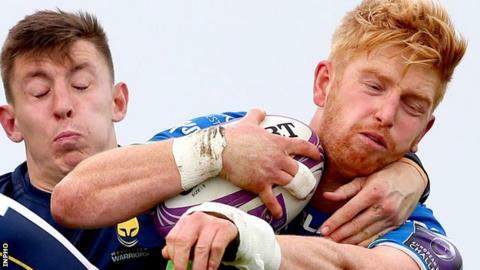 Connacht made it two wins from two in the Challenge Cup as Worcester lost their ninth away game in a row in the tournament at the Sportsground. Eoghan Masterson marked his first game as Connacht captain with a sixth-minute try and a Jack Carty penalty left it 8-0 at half-time in a dour struggle. Josh Adams briefly gave Worcester hope as he touched down after 52 minutes. Matt Healy's try sealed it for the home side although Josh Lance's late penalty saw Worcester pick up a bonus point. Worcester had a bonus-point victory against Brive in last Saturday's group opener to earn their first win in any competition since April. However their poor away form continued with Connacht starting brightly, fit-again Tiernan O'Halloran's break was well finished by Masterson in the sixth minute. Connacht, who rested a number of regulars, were comfortable with the wind in the first half. The visitors adopted a conservative approach in that first period but showed more ambition after the interval. A break by Dave Denton split the Connacht defence and when the play was spread wide, Adams crossed in the left corner to close the deficit to 8-5. Three minutes after coming on the field, Ireland scrum-half Kieron Marmion created Connacht's winning try. Healy seized onto his grubber kick and sprinted home with Carty adding the extras. Australian fly-half Jono Lance, making his first start for Worcester, nailed a penalty in the 75th minute to secure a losing bonus point for the Premiership strugglers. Connacht: O'Halloran; Leader, Aki, Griffin, Healy; Carty, Blade; Buckley, Heffernan, Robertson-McCoy; Roux, Cannon; McKeon, Connolly, Masterson. Replacements: Delahunt, McCabe, Carey, Gallagher, Butler, Marmion, Ronaldson, Kelleher. Worcester Warriors: Pennell; Howe, Olivier, Willison, Adams; Lance, Arr; Waller, Singleton, Milasinovich; Phillips, Spencer; Denton, Faosiliva, van Velze. Replacements: Williams, Bower, Kerrod, O'Callaghan, Taylor, Dowsett, Olver, Humphreys.